Adobe has announced the latest version of professional photo and video editing software suites, Adobe Creative Suite 5 or Adobe CS5. The new version Adobe CS5 comes with 15 different tools aimed at various design or development tasks. Adobe CS5 includes new versions of 14 products and their associated apps, four new online services, and a brand new interactive Web design product. Adobe CS5 products integrate with Adobe’s new CS Live, a set of five online services that augment key aspects of the creative workflow. CS Live online services are complimentary and free for now and include: Adobe BrowserLab, Adobe CS Review, Acrobat.com, Adobe Story, and SiteCatalyst NetAverages from Omniture. 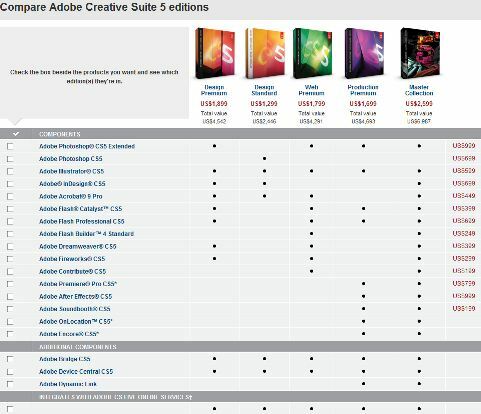 Adobe CS5 is available in 5 different flavors/editions as listed below, together with the official pricing and the apps included in each editions. The Web Standard edition has been discontinued. – Includes Photoshop Extended, Illustrator, InDesign, Acrobat 9 Pro, Flash Catalyst, Flash Professional, Dreamweaver and Fireworks for print and online designers. – Includes Photoshop Extended, Illustrator, Flash Builder 4 Standard, Flash Catalyst, Contribute, Acrobat 9 Pro, Flash Catalyst, Flash Professional, Dreamweaver and Fireworks for web designers. – Includes Premiere Pro, After Effects, Soundbooth, OnLocation, Encore, Photoshop CS5 Extended, Illustrator, Flash Catalyst, and Flash Professional for videographers. 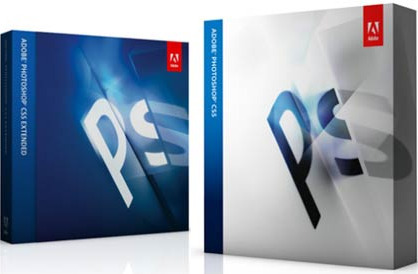 – All Adobe CS5 programs except Adobe Photoshop Standard. Note: All the Adobe CS5 editions ship with Illustrator, Bridge, and Device Central; and most editions integrate with Adobe’s CS Live online services. Adobe Acrobat Pro 9 is not a new upgraded version, which is also available individually at $449 for full version with upgrade license at $159. Adobe CS5 is also available in individual product. For example, customers can purchase only Adobe Photoshop CS5, which comes in Standard and Extended packages. The primary difference being that Photoshop CS5 Extended delivers everything in Photoshop CS5 plus tools for creating, editing 3D and motion-based imagery. The software is priced at $699 for standard version (upgrade license at $199) and extended version $999 (upgrade license at $349) respectively. Other applications in the Adobe CS5 suites include InDesign CS5 (Full: $699; Upgrade: $199), Illustrator CS5 (Full: $599; Upgrade: $199), Premiere Pro CS5 (Full: $799; Upgrade: $299), Dreamweaver CS5 (Full: $399; Upgrade: $199), Fireworks CS5 (Full: $299; Upgrade: $149), Contribute CS5 ($199; $99; five-user multi-pack: $799), Flash Catalyst CS5 (Full: $399), Flash Professional CS5 (Full: $699; Upgrade: $199), Flash Builder 4 Standard (Full: 249; Upgrade: $99), After Effects CS5 (Full: $999; Upgrade: $299) and Soundbooth CS5 (Full: $199; Upgrade: $99). InCopy CS5 does not ship with any suite, but it has been upgraded for use with InDesign CS5. A single InCopy license is $249 with an upgrade price of $89. Download Adobe CS5 for Windows and Mac.